English is now cosidered as a ‘lingua franca’. The dominant language, which reaches to the whole world, perhaps due to be an European Union’s official language. It is the third most commonly spoken language in the world in terms of native speakers, after Mandarin Chinese and Spanish. Approximately 375 million people speak English as their first language. As you surely know, this is the most popular additional, second language in schools all around the globe, so this huge number grows, as we consider native speakers as well as non-native speakers. It is usually used for scientific publications, business contracts. Currently, you are able to hear English in the every small recess. In the USA, the UK and many Commonwealth countries it is taken as an official language, but it has no legal confirmation. When it comes to a history, English is a West Germanic language – a sub-group of the Anglo-Frisian, which, of course, was brought to Britain by German settlers, named the Angles. The USA was, at first, Brtiain’s colonies, so it is obvious to conclude, that inhabitants spoke the English too. Just like a Sting’s comparison in a song: „Englishman in New York”, we can compare also British English with American English. Have you ever been thinking how similar as well as different they are? I’m to touch it to You. Let’s focus on some examples. The next difference we can find in single words. It’s not hard to meet with names of things or verbs, which have completely other equivalent. According to a category „names of things”, the coincidences like these one appear. In British English it is normal to say ‘a tube’ or ‘an underground’, but in American English you won’t experience it, there you hear ‘a subway’. As we get to this point, something came to my mind. In Britain ‘chips’ are made of potatoes and surved with fishes as a meal, but in America it has a different meaning, ‘chips’ is a snack, whilst a dinner’s part is known as ‘fries’. I’m pretty sure that these equivalents cause no end of trouble for Americans in Britain and Britans in America. Except from a gamut of exception, the dictionaries in both countries contain the same words. Canada is the world’s second-largest country located in the northern part of America. The capital city of Canada is Ottawa. It is the fourth-largest municipality in the country with a population of 1,130,761. Canada is a constitutional monarchy with Queen Elizabeth II as its head of state. The three largest cities in Canada are Toronto, Montreal and Vancouver. Toronto, the largest city in Canada, has a population of 5,113,149. Canada is most common of Niagara Falls. It is a city in Ontario by Niagara River, which forms the border between Canada and the USA. 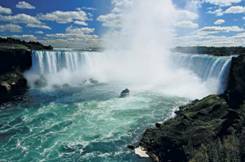 Niagara waterfall, located near the city center, attracts every year hundreds of thousands of tourists from around the world. Canadian culture has historically been influenced by British, French, and aboriginal cultures and traditions. There are distinctive Aboriginal cultures, languages, art, and music spread across Canada. In Canada there are two official languages, English and French, and over 100 other non official languages. English is the mother tongue of 59.7% of the Canadian population, while French is the mother tongue of 23.2%. In 2006, just under 20.6 million Canadians spoke English at home. English is the major language everywhere in Canada except Quebec. Most Canadians can speak English and usage of English at home has remained relatively constant. Some of the most common non-official first languages include Chinese, Spanish, Italian and German. Australia is the biggest island in the world. Officially it’s called the Commonwealth of Australia and is a country in the Southern Hemisphere comprising the mainland of the Australian- the world’s smallest – continent, the island of Tasmania, and numerous smaller islands in the Indian and Pacific Oceans. Australia is a constitutional monarchy and Autralia’s head of state is Queen Elizabeth. The capital city of Australia is Canberra. With a population of over 345,000. The largest city in Australia and Oceania is Sydney with 3.7 million people. It’s a busy, modern city and its high-rise buildings are the centre for much of Australian business. 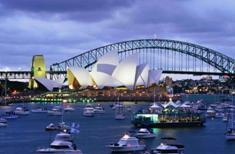 The most well-known attractions include the Sydney Opera House and the Sydney Harbour Bridge. Other large cities are the mainland state capitals: Sydney, Melbourne, Brisbane, Perth and Adelaide. Since 1788, the primary basis of Australian culture has been Anglo-Celtic Western culture. Since the mid-20th century, American popular culture has strongly influenced Australia, particularly through television and cinema. Other cultural influences come from neighbouring Asian countries, and through large-scale immigration from non-English-speaking nations. English is the national language. Australian English has a unique accent and a small number of unique terms, some of which have found their way into other dialects of the English-speaking world. Grammar and spelling are largely based on those of British English. According to the 2006 Census, English is the only language spoken at home for close to 79% of the population. The next most common languages spoken at home are Italian, Greek and Cantonese. New Zealand is an island country in the south-western Pacific Ocean comprising two main landmasses (the North Island and the South Island), and numerous smaller islands. 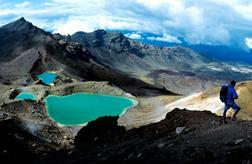 New Zealand is known for its geographic isolation – it is situated about 2,000 kilometres southeast of Australia. New Zealand is a constitutional monarchy and its head of state is Elizabeth II. New Zealand’s capital city is Wellington with a population of 386,000. It is the third mostpopulous city of the country. The urban area of Wellington is situated on the southwestern tip of the country’s North Island. 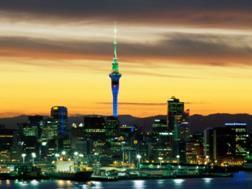 The largest city of New Zealand is Auckland. The Auckland metropolitan area in the North Island of New Zealand, is the most populous urban area in the country. Other large cities of New Zealand are Christchurch and Hamilton. 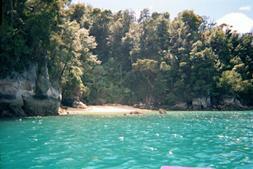 New Zealand is culturally and linguistically part of Polynesia. Much of contemporary New Zealand culture derives from British roots. It is made up of significant influences from American, Australian and Māori cultures, along with those of other European and Asian cultures. Until 1987, English was New Zealand’s only official language, and remains predominant in most settings. Māori became an official language in 1987 and New Zealand Sign Language in 2006. The two official spoken languages, English and Māori, are also the most widely used. English is spoken by 98% of the population and Māori by 4.1%. Samoan is the most widely spoken non-official language, followed by French, Hindi, Yue and Northern Chinese.